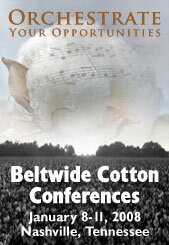 It’s off to Nashville this week and the Beltwide Cotton Conferences. Home will be the Opryland Hotel where several thousand growers, consultants and assorted industry representatives will be getting together. It’s been a few years since I’ve been to Beltwide so I’m really looking forward to seeing some old friends. This year’s theme is “Orchestrate Your Opportunities.” That’s sort of how I would describe blogging a conference. It’s like conducting a symphony of audio visual opportunities whenever and wherever they can be found. Well, it is, sort of. I want to say a big thanks to the folks at BASF for making my trip possible. You can count on seeing some photos, videos and a bunch of interviews during the week starting Tuesday afternoon. Tomorrow is a travel day which includes a stop in St. Louis on the way. Give me a buzz on my mobile if you want. It’s a long drive.